The 47th national Ijtema of Majlis Khuddam-ul-Ahmadiyya Bangladesh was held on 19, 20 and 21 October 2018. The significance of this Ijtema was that for the first time ever, the MKA Bangladesh national Ijtema was held 450 kilometres away from Dhaka city in Ahmadnagar on the Jamaat’s own land. Ahmadnagar is in the extreme northern part of Bangladesh. 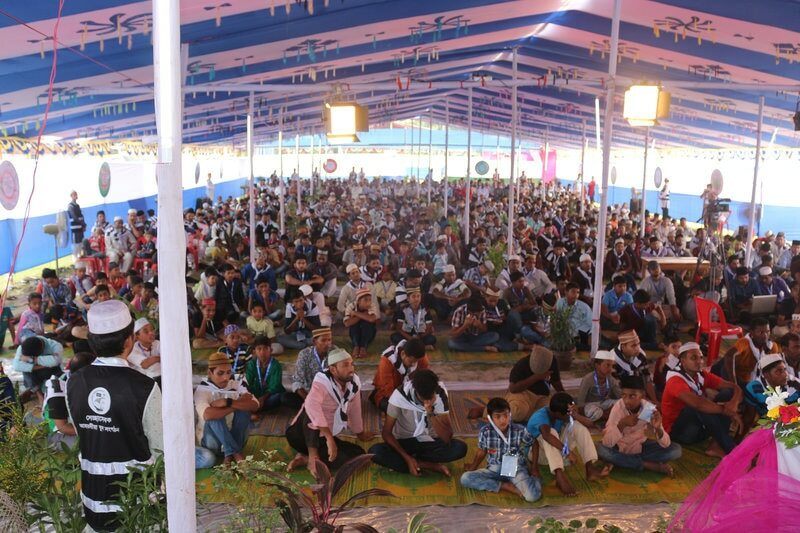 A total of 1,517 Khuddam and Atfal from 78 Majalis participated in this Ijtema. Among them, 1,057 were Khuddam and 460 were Atfal. This is the highest ever attendance in our National Ijtema, Alhamdolillah. On 19 October at 11:30, National Amir Sahib and Sadr Sahib hoisted the flags of Bangladesh and Khuddam-ul-Ahmadiyya respectively followed by dua. Then, through the formal opening session, National Amir Sahib inaugurated the Ijtema. This year, there were separate tents for Khuddam and Atfal for talimi events. Different academic competitions like Quran Nazira (reading), Quran memorisation, nazm (Urdu and Bengali), Arabic qaseeda, speech (Bangla and Urdu) and Adhan were held in Khuddam and Atfal tents. Various sports events took place like football, cricket, kabaddi, strong man competition and volleyball. On the evening of 20 October, a career guideline programme was conducted where two topics were discussed by panel speakers – Attributes of a Good Student and How to Eliminate Unemployment. The total presence of this event was 500. There was a Tarbiyati Session on Saturday evening where Maulana Muhammad Solaiman Sahib and Maulana Abdul Awwal Khan Chowdhury Sahib delivered valuable speeches. 850 participants joined this session. This session was telecast live on YouTube. Atfal conference was conducted parallel to the aforementioned event where 410 Atfal attended. This year, arrangements were made for a tabligh corner where one missionary was available at all times to answer questions by external guests. 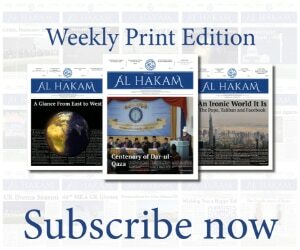 During the Ijtema days, 5 external guests accepted Islam Ahmadiyyat. On Saturday afternoon, various local administrators and journalists were invited for lunch. In this programme, the local chairman and other distinguished guests attended. 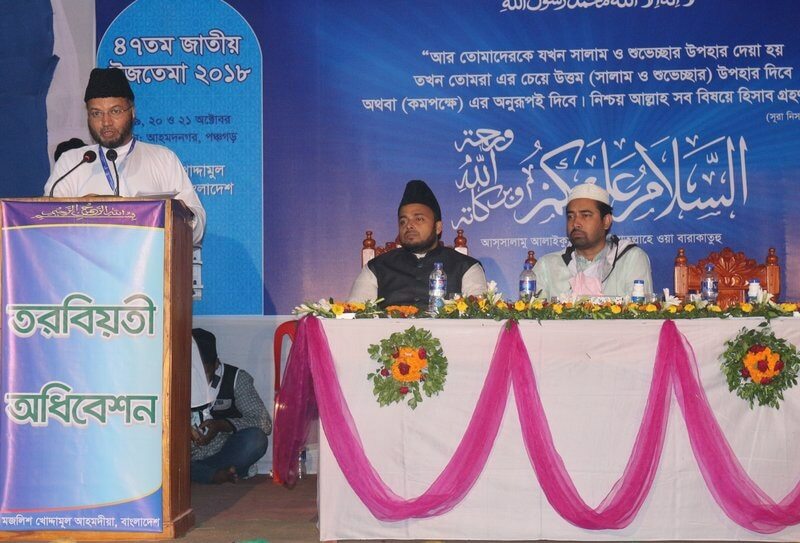 Sadr Sahib presented a report of Khuddam-ul-Ahmadiyya Bangladesh’s activites and the humanitarian works of our Jamaat. Attended guests praised and commended our activities and disciplined manner. On Sunday evening, National Amir Sahib concluded the Ijtema with the prize-giving ceremony and silent prayer.